In accordance with Divine promise, the true and ardent devotee of the Holy Prophet (peace and blessings of Allah be on him) was sent to start the second phase of Islam. Fortunate were those who experienced the time of fresh revelations after 1400 years and were the recipients of direct beneficence of the Promised Messiah (on whom be peace) after taking bai’at on his hand. It is very moving to visualise and imagine how these companions would have glorified God and be grateful to Him at finding themselves in close proximity of the Promised Messiah (on whom be peace). God is true to His promise and He states in the Holy Qur’an that He will send people among the latter-ones who will join the earlier ones and He strengthened the faith of these companions by manifesting fresh signs for them through revelations given to the true and ardent devotee of the Holy Prophet (peace and blessings of Allah be on him). Their each morning would start in eager anticipation to know what revelation had been received during the night. Hazrat Musleh Maud (may Allah be pleased with him) said that at day break Ahmadis used to wander around with keen expectation wishing to find out what revelation had been received the night before. They would ask whichever of the Promised Messiah’s children they saw about this. Hazrat Musleh Maud says he and his siblings too would quickly look at the Promised Messiah’s note book as soon as he left for Salat to see any revelation noted down or they would hear about the revelation in the mosque from his blessed mouth. Thus was the zest to strengthen faith, glorify and thank God for enabling to accept the Promised Messiah (on whom be peace). It was also the case that revelations were received in the presence of companions who were fortunate to listen to God’s revelation in person. Hazrat Musleh Maud (may Allah be pleased with him) says that a devoted companion called Sayyed Fazal Shah Sahib spent a lot of time serving the Promised Messiah. His brother Syed Nasir Shah Sahib had advised him to stay in Qadian for this purpose and to seek prayers and had committed himself to meet all expenses of his brother while he stayed in Qadian. Hazrat Muleh Maud says he remembers that a revelation of the Promised Messiah was received when he was suffering from kidney pain and Fazal Shah Sahib was massaging him. He had the distinction to be present at the time of revelation being received the words of which flowed from the tongue of the Promised Messiah. Hazrat Musleh Maud says he was very young at the time and out of carelessness entered the room where Fazal Shah Sahib was massaging the feet of the Promised Messiah and could sense that revelation was being received. He gestured the children to leave. It was later found out that it was a very long revelation which was about the incident of Mirza Imam ud Din raising a wall. The ensuing court case appeared to go in favour of Mirza Imam ud Din but the matter concluded as God informed the Promised Messiah. At the very last minute evidence was found in the documents showing joint ownership of the Promised Messiah’s father along with Mirza Imam ud Din and the court decided in the Promised Messiah’s (on whom be peace) favour and ordered the wall to be felled. This is a glorious revelation which is cited in Tadhkirah and Haqiqatul Wahi. The Promised Messiah (on whom be peace) himself translated the Arabic revelation in Urdu. Below is its English translation. Each time a court case was brought against the Promised Messiah (on whom be peace) it backfired on the opponent. Hazrat Musleh Maud said the words of the Promised Messiah (on whom be peace) which he had directly heard, resounded for him years later. He recalled how as a young boy he sat in the assemblies of the Promised Messiah (on whom be peace) and heard explanation of so many issues. Later, when he read the books of the Promised Messiah it felt that he had heard the subject-matter before. This was because it was the practice of the Promised Messiah (on whom be peace) to give discourses in his evening assemblies regarding whatever he had written during the day. The Promised Messiah (on whom be peace) used to say that miraculous belief protects one from stumbling. This is the belief which is based on observation and while one with such belief listens to opposing arguments, they fail to have any impact because one has seen God with one’s spiritual eyes. Relating an account of Munshi Aroora Khan Sahib, a companion, Hazrat Musleh Maud said Munshi Aroora Sahib was told by many people that if he heard one speech of Maulawi Sana Ullah he would realise whether or not Mirza Sahib was truthful. Munshi Sahib happened to listen to a speech by Maulawi Sana Ullah and was asked if after listening to so many arguments Mirza Sahib could still be considered truthful? Munshi Sahib replied that he had seen the face of Mirza Sahib, therefore even if Maulawi Sana Ullah made speeches for two years before him he would say Mirza Sahib was truthful. He said even if he could not answer the arguments of Maulawi Sana Ullah he knew in his heart of the truth of the Promised Messiah (on whom be peace). Perfect belief is not based on intellect rather it is based on observing. We should try and see God with our spiritual eyes and our belief in the Promised Messiah (on whom be peace) will also be complete when we will comprehend that God sent him for reformation and the time was crying out for him. Indeed, the condition of the world is a proof of his truthfulness that he came in this corrupt age, in accordance with the prophecy of the Holy Prophet (peace and blessings of Allah be on him). His advent was the need of the time and each moment of his life was a proof of his truthfulness. This should always be remembered and we should strengthen our faith with reference to this fact. May others also be drawn to this fact! Hazrat Musleh Maud relates that Munshi Aroora Khan Sahib was named Aroora according to a custom of the time. Families who suffered infant/child mortality would drag their children in dirt heaps in a ritualistic manner in the hope that they would survive; this was a mind-set, and they would then accordingly name the child Aroora. [The word aroora connotes ‘of the dirt heap’). Munshi Aroora Sahib’s parents had also named him in this way but in God’s eyes he was not like that. God brought him to the Promised Messiah (on whom be peace) and saved him from physical as well as spiritual death, found him pure-hearted and blessed him with belief. The Promised Messiah (on whom be peace) said it is pointless to hope for salvation without this kind of sincerity. Hazrat Musleh Maud (may Allah be pleased with him) said Munshi Aroora Sahib worked for a Judge. He visited Qadian once a month. On the day of his departure for Qadian the Judge used to say to his staff to wrap up work quickly and not delay Munshi Sahib because he felt any likely grievance Munshi Sahib felt for not being able to leave for Qadian in time would cause the Judge’s ruin. He was a Hindu but was so influenced that he would himself facilitate Munshi Sahib leaving work in good time on the day he had to go to Qadian. Hazrat Musleh Maud said God reciprocates in kind to man. God responds in the same way to one whose heart melts for God. The world abuses and persecutes such person but he bounces back from all adversity. It is communities of such people that thrive. If we were to instil such a love for our community we would find how God would enhance us. Sometimes, those who become God’s do not even have to ask Him for something and they indulgently say they will not ask God. Hazrat Musleh Maud says he heard from the Promised Messiah (on whom be peace) that once a holy person was in great difficulty. People asked him as to why he did not pray? He replied that if his God did not want to give him what he wanted it would be impertinent of him to ask. If it was not God’s will for him to have something, how could he ask? On the other hand he said if God wanted to bestow him it would be impatience on his part to ask! This account does not mean prayers should not be made. It means that at times perfect believers are in a situation where they feel they should not ask God. Supplication is of course commanded by God. It is just that at times people who have very close connection with God feel indulgent as regards their personal relationship with God. This status is not easily attained. It cannot be attained without deep humility during Salat, without giving charity, or by being negligent in contributing financially in the way of God and by being deceptive and through lying. Qazi Ameer Hussain Sahib was a very staunch Wahhabi before becoming Ahmadi and as such could not abide by certain apparent etiquette. During the time of the Promised Messiah (on whom be peace) people used to stand up for him in respect. Qazi Sahib felt this was not warrantable and was a form of shirk (associating partners with God) and he argued against what he found unacceptable. When Hazrat Museh Maud became Khalifatul Masih, once Qazi Sahib he stood up for him. Hazrat Musleh Maud reminded him that according to him this was shirk. Qazi Sahib laughed and replied he thought it to be the case but he could not help himself and stood up without realising. Hazrat Musleh Maud told him therein was the answer to all his criticism. To stand up for someone owing to pretension was shirk but to stand up instinctively was not. The Promised Messiah (on whom be peace) said that some aspects are such that pretention can make them shirk. Once at the death of her brother Hazrat ‘Aishah (may Allah be pleased with her) spontaneously let out a scream and also hit her face with her hand. She said this was a spontaneous reaction and she did not do it knowingly. Hazrat Musleh Maud (may Allah be pleased with him) said that he heard the Promised Messiah (on whom be peace) relate that in the time of Haroon Rashid a holy person was imprisoned on the pretext that he could cause some disorder. His release order came at midnight and out of the blue. He was astonished. When he met the King he asked him why he was suddenly released. The King told him that he had a dream that he is asleep and is awakened in the dream by the Holy Prophet (peace and blessings of Allah be on him) who asked him, Haroon Rashid, what is this that while you sleep peacefully my son is in prison! This prompted the King to instantly issue order to release the holy man. Hazrat Musleh Maud related that Munshi Aroora Sahib, a devotee of the Promised Messiah (on whom be peace) used to visit Qadian every week. He would walk some distance of his journey to save money which he could present to the Promised Messiah (on whom be peace). His income was meagre and Hazrat Musleh Maud says he saw him wearing one coat all his life and his clothes used to very simple and modest. It was his wish to steadily save up money to present to the Promised Messiah. Due to his honesty, over time he was promoted and his earning increased. A renowned account of his after the passing away of the Promised Messiah (on whom be peace) relates that he visited Hazrat Musleh Maud and wept intensely. He took out a few gold coins and said he wanted to present those to the Promised Messiah but was not enabled. Saying this he started weeping intensely again. Hazrat Musleh Maud said this is ardent love and devotion. 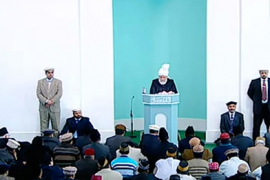 He said there are many bounties of this world and if they can bring real comfort, a true believer’s heart is pained at utilising them with the thought that they should have been there for the Holy Prophet (peace and blessings of Allah be on him). A tradition relates that Hazrat ‘Aishah (may Allah be pleased with her) became tearful when she ate bread made of finely-milled flour at the thought that the Holy Prophet (peace and blessings of Allah be on him) only ever ate bread made of roughly-milled flour. Hazrat Musleh Maud says when he was young he became interested in hunting and used to hunt using an air gun. As a youngster, he was aware that his blessed father the Promised Messiah (on whom be peace) had a very meagre diet but did tremendous mental work. He had heard that game was good for those who did mental work. So, whatever he hunted he would present to the Promised Messiah and never ate it himself. Such is perfect love and devotion that one wishes to facilitate all pleasures and comforts for one’s beloved. Hazrat Musleh Maud (may Allah be pleased with him) said that God unfolded and opened up a lot of knowledge of the Holy Qur’an to him and many times he felt that had the knowledge been given to him in the life of the Promised Messiah or Hazrat Khalifatul Masih I, he would have presented it before them to please them. He said of course the Promised Messiah (on whom be peace) had the real status but he also thought of Hazrat Khalifatul Masih I because he taught him the Qur’an and gave him a lot of love and wanted him to study the Holy Qur’an and discover its meanings. Contrary to the devoted souls who ached to be in Qadian there were also some for whom the pious atmosphere of Qadian became too much. A man came to Qadian in the lifetime of the Promised Messiah (on whom be peace) but left after a day. Someone had sent him to Qadian with the thought that he would stay there and listen to the discourses of the Promised Messiah (on whom be peace). He was asked the reason for his abrupt departure. The man said Qadian is not a place for decent people. When asked to explain, he said. I arrived Qadian in the morning and was well looked after. I told them I had travelled from Sind and did not get a chance to smoke hookah during my journey and wanted to smoke hookah and relax. There was some delay in the hookah preparation when someone said Hazrat Maulana Nur ud Din was about to give a dars of Hadith, so I went and listened to the dars thinking I will have my hookah at leisure after the dars. After the dars someone said lunch was ready, have lunch first. I thought fine, I will relax after lunch and smoke hookah. After lunch Zuhr adhan was heard and I was asked to join Zuhr Salat. After Salat Mirza Sahib held an assembly. I thought, very well, let me listen to Mirza Sahib and then smoke hookah. Later, having been to toilet, I lighted the hookah and had barely taken two puffs when it was time for Asr Salat. I thought I will be free to smoke hookah in the evening. Just then someone said Maulana Nur ud Din was giving a dars of the Holy Qur’an. Soon after the dars, Maghrib adhan was sounded and hookah smoking still did not come to pass. After Salat Mirza Sahib held another assembly. I thought maybe I will have hookah after this but it was dinner time. After dinner I thought it was now time for hookah but people said lets offer Isha Salat. After Salat I thanked God that now there would be nothing more to do and I could eventually enjoy my hookah. I had barely lighted my hookah when I found out that Maulana Nur ud Din Sahib advised people visiting from outside Qadian after Isha. Maulana started preaching. My journey had been tiring and owing to this I fell asleep while still sitting and had no clue where I was and where my hookah was. When I awoke the next morning, I gathered my bedding and ran, thinking Qadian is not a place for a decent man stay! I want to briefly say something on the current world situation. Members of Jama’at need to greatly turn to prayers in light of the way the world is fast moving towards destruction. In wake of the barbaric events in France, and in their decision to take severe measures against the so-called Islamic State situated in Syria and Iraq, Western governments now plan air strikes there, in fact they have already begun air strikes. If these governments want to carry out air strikes they should aim them at those who are perpetrating cruelty. May Allah save the innocent public from these attacks! Most people living in Syria are enduring untold suffering. They have no way out. The neighbouring Muslim countries are also not serious about stemming this evil. What was needed was for the neighbouring countries to get together and help the governments there to eliminate this evil. However, the evil was allowed to grow, so much so that now it has spread all over the world. It is also being said that some of the neighbouring Muslim countries are doing trade with the so-called Islamic State, they are buying oil from them. Russia has accused Turkey of this although Turkey has denied it and in turn has made accusations against Russia. In any case something or the other is going on and trade is taking place. I have been saying this for many years now. Russia has also joined the Western world in the air strikes although it does not see eye to eye with them. Russia is on the side of the government of Bashar al-Assad while the rest of the world is against him. At this time however, both have Daesh as their mutual target. In spite of this, as I mentioned earlier, there is discord between them. If situations gets serious, China announces backing Russia. The Syrian government says the European air strikes will not benefit unless they are carried out in conjunction with them. Turkey brought down a Russian air craft and the fallout from that resulted in greater statements and announcements of enmity. It is also said that if the so-called Islamic State has to leave Iraq and Syria it plans to makes its station and seat of government in Libya. What will be the result of this? Obviously, if it is to be eliminated, it is not a remote possibility that air strikes will start in Libya and again civilians will be killed. Western countries first help these governments and then turn against them and either change the regime or make efforts to change it. The current disorder in the world is caused by lack of justice perpetrated for a very long period of time. Unfortunately Muslim governments also practice injustice and cruelty in their own countries. In short, the state of affairs is so complicated that it is like a world war situation. Although it should be said that a world war has begun on a small scale. Many analysts here have started to acknowledge this and are writing that a world war has begun. I have been drawing attention to this for many years. Now others are also saying the same. Yet, it still appears that neither the big powers nor the Muslim governments will be drawn to act with justice. On the face of it, it seems that everyone is together in taking actions against the so-called Islamic State, so that it may be eliminated and peace can be restored. However, certain matters indicate that even if this evil is eliminated the situation will not get better. Rather, later on the big powers will start their own skirmishes and it is not unlikely for war to ensue. This is because grievances between Russia and other Western powers are on the increase and the outcome will once again be most loss of life among civilians. This is what we have seen in the past wars that most lives lost were those of innocent civilians. In light of this a lot of prayers are needed. May Allah the Exalted save the world from destruction! In addition, in the past few years I drew attention of the Jama’at to take some precautionary measures. Attention should be paid to that. I have briefly indicated towards some matters here. I again draw attention to pay great attention to prayers. May Allah the Exalted give sense to governments and big powers not to take the world towards destruction!